A couple weekends ago, I was doing rather a lot of the opposite of blessing. My husband’s squadron had decided that it was sending a gaggle of instructors and students out of town in an effort to find better flying weather. 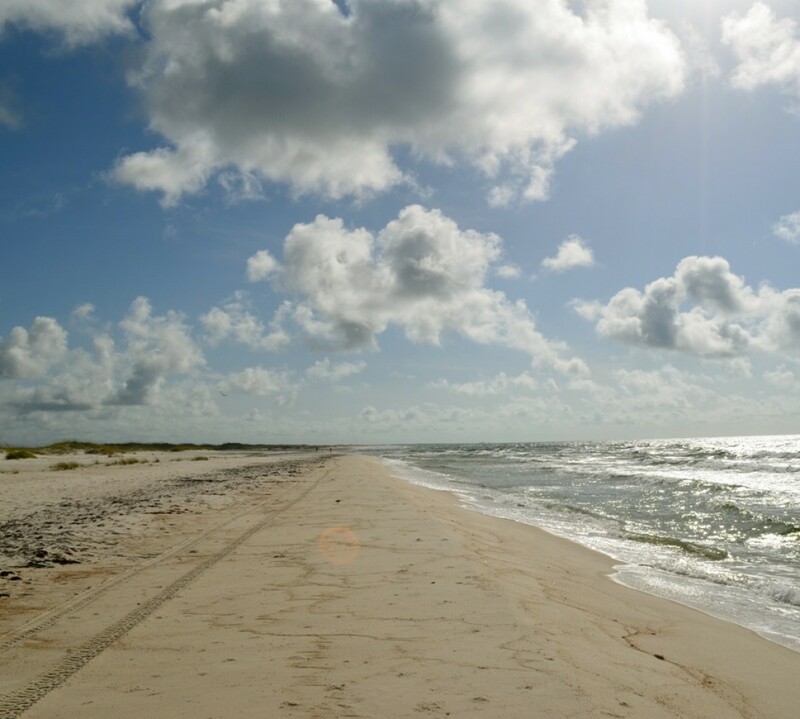 The issue is that the decision was made on Friday that the trip would begin on Monday, which meant that there was no time during the workweek for my husband and his colleagues to make the necessary lodging and other logistical arrangements. Our weekend was interrupted over and over again by the buzzing of my husband’s cell phone as everyone tried to bring the plans together by text message. Each new message took me further along the path from “mildly annoyed” to “irked” to “cursing the OPSO, the squadron, and the Navy with remarkable relish and far-ranging creativity.” By Sunday night, I was irritated with my husband for having the gall not to join me in my excoriation of his superiors and minute, trenchant analysis of their shortcomings both personal and professional. In that moment, understanding broke through my annoyance, and I was ashamed. What I had been telling myself was companionable commiseration over a crappy set of circumstances was being received as a shove off balance. I had, in turn, misinterpreted my husband’s need to maintain an even keel as a frustrating lack of acknowledgement of my efforts to vent “with” him, never mind that he never expressed a desire to vent in the first place. Now I have an understanding that I didn’t have before, thus proving that there is still more to learn even after almost a decade of having a significant other on active duty in the Navy. Next time we run into one of these not-uncommon military inconveniences, I’ll know better, and that insight will feel like a blessing. Baruch atah, Adonai, chonein hadaat. Blessed are You, Adonai, who graces us with knowledge. 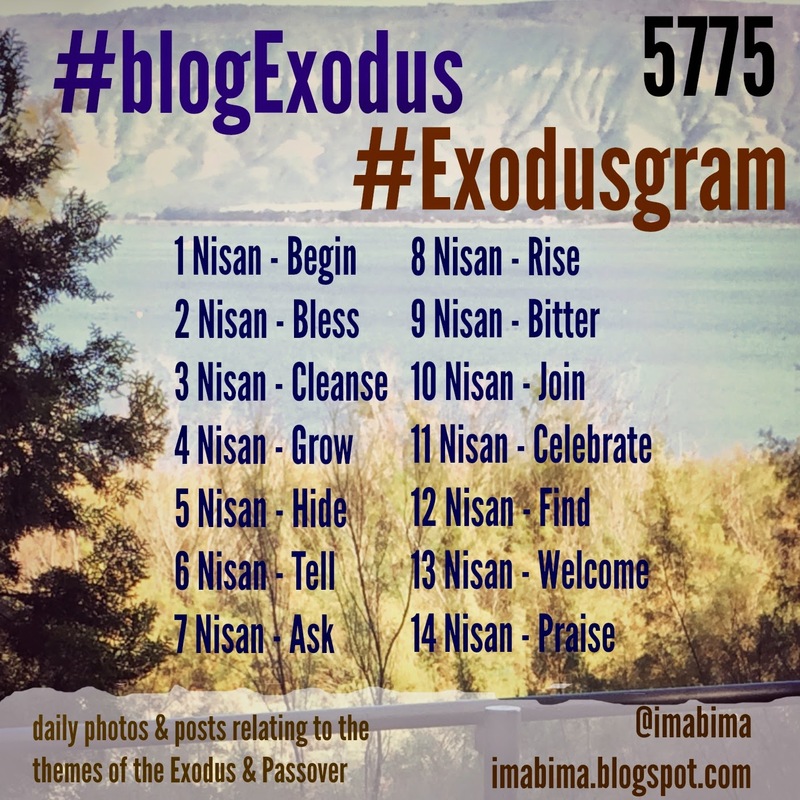 Jewish days begin at sundown, and this evening is rather special in that we welcome not only Shabbat, as we do each Friday evening as the sun sinks below the horizon, but also the Jewish month of Nisan. The vernal equinox and the first day of of Nisan happen to kiss this year. Thanks to this fitting quirk of the juxtaposition of our secular solar and religious lunisolar calendars, the first day of spring marks just two weeks until Chag haAviv, which means “the spring holiday” in Hebrew. It has a lot of names, this holiday, the spring holiday, but in English we call it Passover. 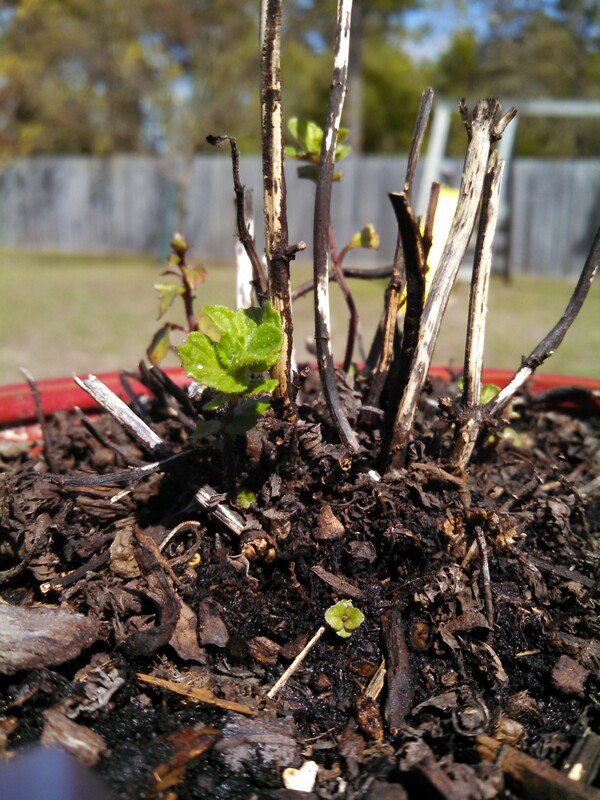 Today marks the conjunction of a profusion of beginnings. New season. New month. New year, on top of it all (there are four new years on the Jewish calendar). We brim with beginnings; we love them so much that we strew them like flower petals throughout our days. For a Jew, a calendrical fresh start is never far out of reach. Naturally, I would like to get season, month, and year off on the right foot, and simple wishes seem most appropriate to me. Chodesh tov! A good month to you. Shabbat shalom! A peaceful Sabbath to us all. 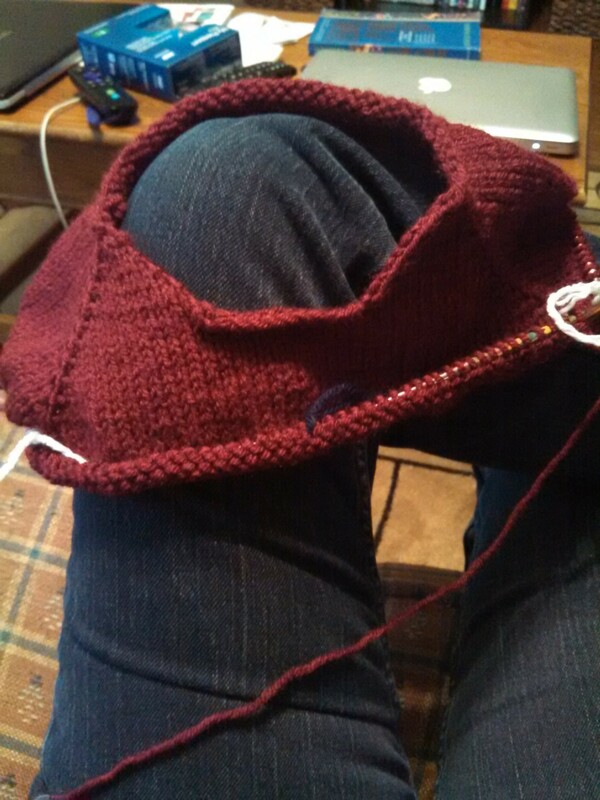 Partway through the raglan increases. I first picked up a pair of knitting needles in June 2010, and I’ve come a long way since my first fumbling, awkward cast-on (only achieved by dint of watching YouTube instructional videos over and over and over again). No matter how much I had accomplished, though, something deep in my fiber-crafting soul told me that I must someday tackle The Sweater. The compulsion finally won out at the beginning of February, and I embarked on calculations for my very own Incredible Custom-Fit Raglan. Torso mostly complete. Being able to try it on as I went was key. I knit like a woman obsessed, which wasn’t difficult because I had deliberately opted for a simple, no-frills, plain stockinette version. 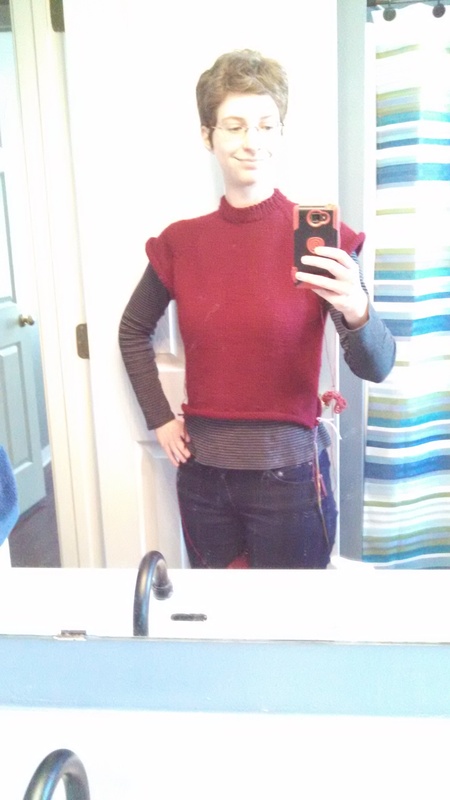 The elapsed time from casting on the neck stitches to binding off the second sleeve was two weeks. We’re stationed in Florida, you see, and February’s arrival meant that warm weather was potentially just around the corner. I was racing the arrival of springtime, and if I lost, I would not likely have the chance to wear my new sweater until November. I won the race, and although it’s definitely warming up now (just ask my allergies), I’ve had a number of opportunities to wear my cozy burgundy sweater. I learned a lot about in-the-round garment construction on this project, and I’ve got my eye on rather more complicated variations in the future. Some of them might even be appropriate for warmer weather (think lacy cardigans), so I won’t get too frustrated waiting for our too-short chilly season. Ta-daaa! 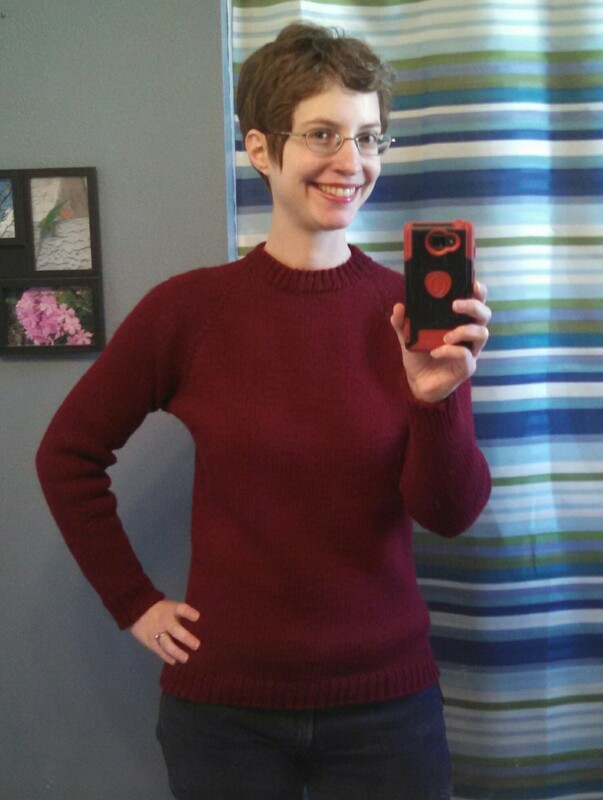 It’s a real, wearable (in public, even) sweater! 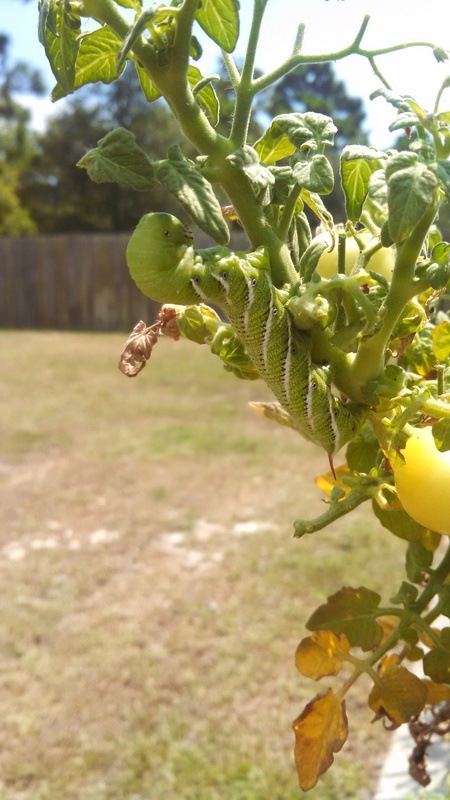 Well, not really fresh off. 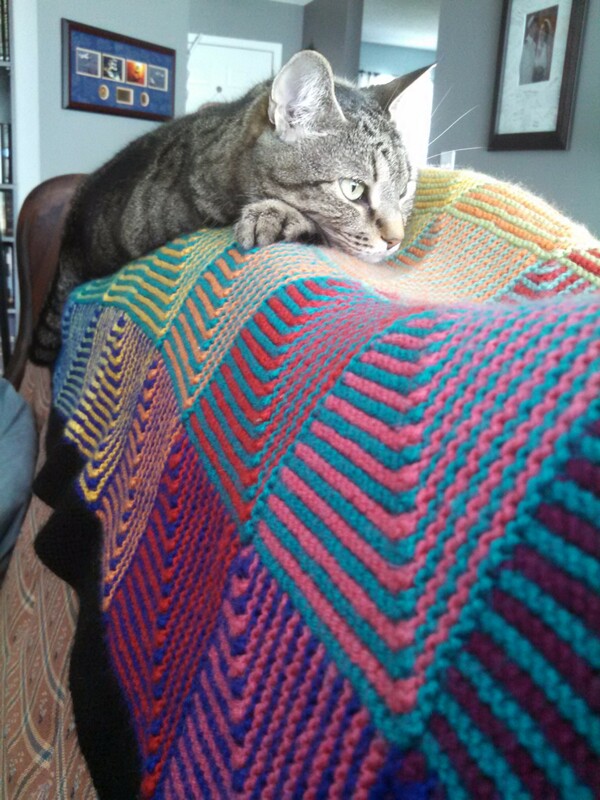 I finished my Hue Shift Afghan back in February, and it has been brightening up our ratty old vintage couch ever since. Well, this is the finished product spread out in all its glory on our bed, which is not a couch. Thank goodness. 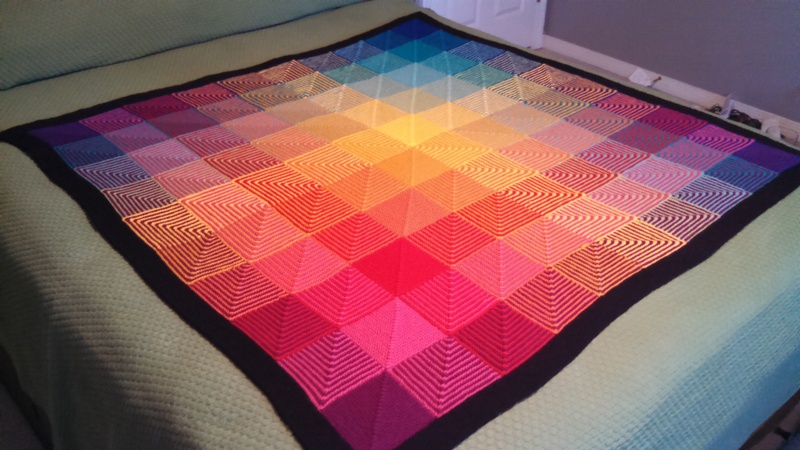 Another view of its full-spectrum yarniness. Our cats immediately decided that I had spent fifteen months (well, there was a lengthy summer hiatus when it was just too dang hot in the Florida panhandle to even contemplate knitting a big ol’ blanket) of my crafting life solely to provide them with their very own handmade snuggly thing. Stripy cat. 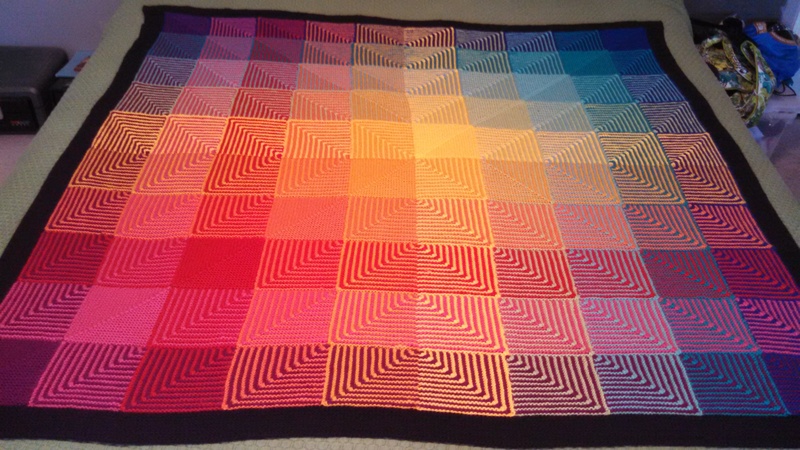 Stripy blanket. It was meant to be. 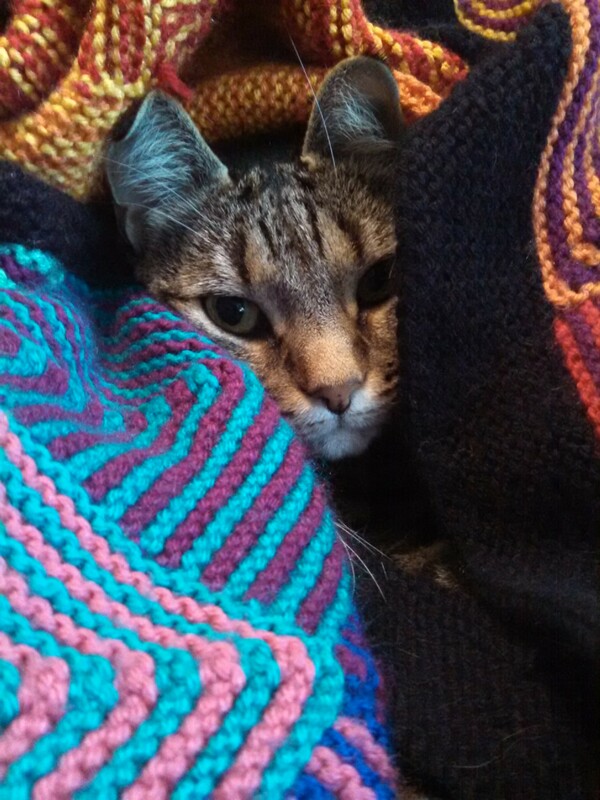 Immediately after I snapped this shot, Val pulled her head all the way back inside her snuggly sanctum. The pattern was an enjoyable, easy-to-memorize knit, which made it a great project to work on during semi-weekly knit/crochet get-togethers with my next-door neighbor. I could envision making another one in the future, particularly if I scale it down for a baby blanket. Maybe I could power through that in somewhat under a year and a quarter. Missed Parts I and II? Check out January through April and May through August. 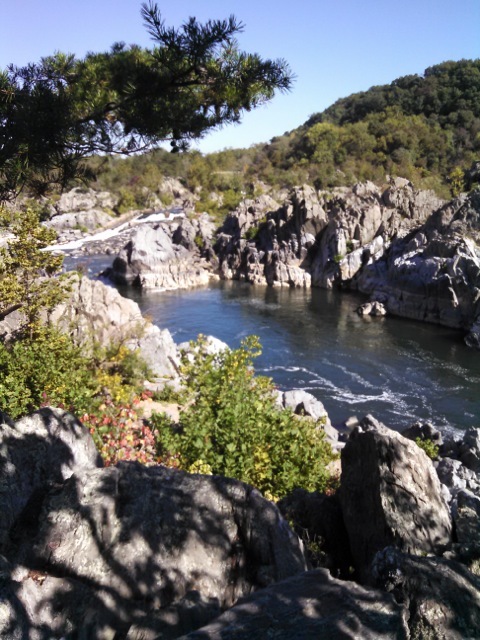 The Potomac River has many faces, all of them beautiful to us. My husband took a week of leave in September so we could spend Rosh Hashana (the Jewish New Year) with our family in Northern Virginia. When we weren’t davening (praying) or hanging out with our relatives, we managed to squeeze in a hike around Great Falls National Park. The vistas are spectacular, though the view above is of a quieter part of the river downstream of the magnificent rapids. We spent a lot of together time here when we were in high school, so it’s a special place for us. You didn’t know I was a Time Lord, did you? The squadron had a Halloween party, and we geeked it right up. 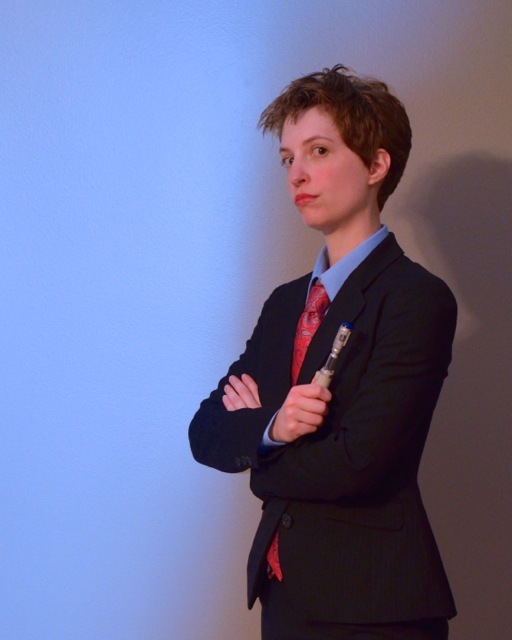 Apparently “Doctor Who” isn’t terribly well-known amongst naval aviators, because we confused the heck out of everyone with our Ninth (husband) and Tenth Doctor (me) costumes. Does my hair look David Tennantish enough? 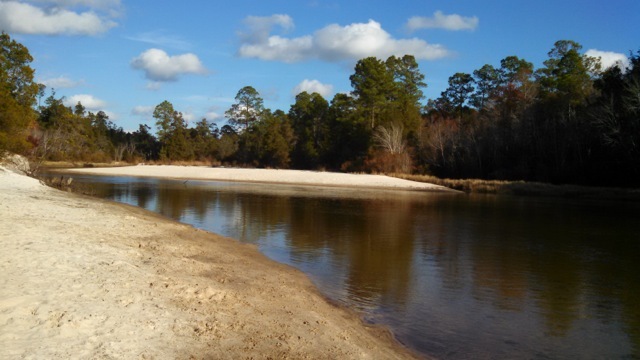 The sandy-bottomed Blackwater River meanders through a forest north of Milton, Florida. Yes, here’s river picture number two in a single post. What can I say? We like rivers. In November, there were finally a few precious days of what I would consider proper early-autumn temperatures. When one such day happened to fall on a weekend, we jumped at the chance to get out of town a little ways and explore a park we’d been meaning to visit again. Our first visit had been the previous summer, and it was hot. With the temperature in a more comfortable range, we were able to truly enjoy a number of little trails by the sandy banks and in the woods. 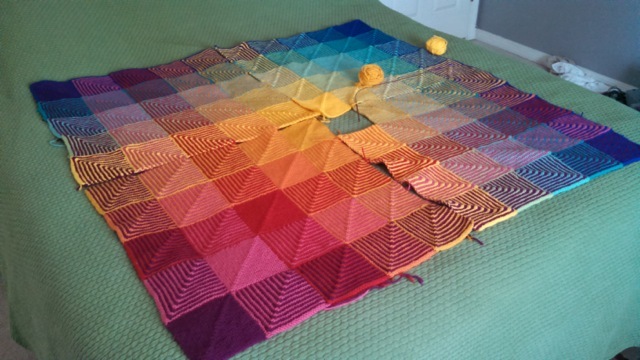 I started on this afghan in the fall of 2013, took a huge break when it warmed up in the spring of 2014, and finally picked it up again when I started getting together with my next-door neighbor to knit on a regular basis in late summer. By December, I was in the home stretch. Since the above photo was taken, I have completed all one hundred squares, stitched the four quadrants together, and begun on the border. Had I not come down with some kind of demonspawn hell-cold right as we were heading out of town on winter leave, I might have finished it on the long road between here and Virginia. If I’m not a complete procrastinator, I’ll have the whole dang Rainbow Dash-worthy thing ready to show off before the end of January 2015. And now we’re all caught up (well, for a somewhat scattershot value of “caught up”) and primed to tackle a fresh year. Hope everything is off to a good start with you!